Adding a backsplash to your kitchen or bathroom is a great way to bring style to your room while preventing damage to your walls in the future. 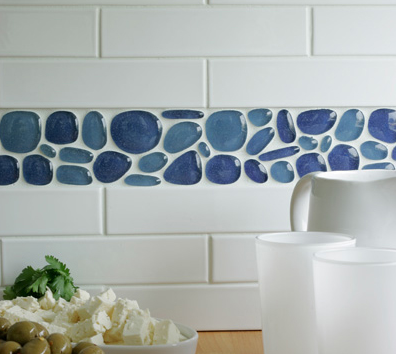 A backsplash is an easy way to bring an eco-friendly element into your home in a beautiful way. Below we breakdown four of the most popular options. Made of post-consumer and post-industrial glass, this backsplash choice is the most popular amongst eco-friendly consumers. These backsplashes are durable, sustainable, affordable, and readily available. Glass backsplashes are beautiful, creating a sparkling effect in kitchens and allowing for easy cleaning. Recycled ceramic backsplashes can be composed of a variety of things including: glass, plastic, tin, and stone. The vast amount of colors and designs makes these backsplashes appealing and unique. Manufacturers of recycled ceramics typically source their products locally to minimize their impact on the environment, so if you like supporting local businesses this might be the choice for you! Recycled aluminum is the most sleek and modern choice out of the four. Made of recycled shavings and scraps from post-consumer and post-industrial aluminum they offer a clean finish. These backsplashes can be attached to plywood, tile backer, or rock board to be mounted. These backsplashes can be comprised of post-consumer and post-industrial glass, porcelain, cement, and even paper. Depending on the manufacturer and available materials, no two products are alike. These backsplashes can incorporate just about anything, even old bathtubs! These are truly a unique choice.